The best part of being the Scan Man is working with rare historical documents. The US National Archives has one of the best collections in the world. Here’s Today’s Document. 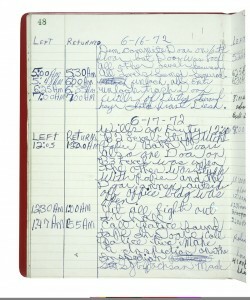 Security Officer’s Log of the Watergate Office Building Showing Entry for June 17, 1972, 06/17/1972 (ARC Identifier: 304970 ); Collection RN-SMOF: White House Staff Member and Office Files (Nixon Administration), 01/20/1969 – 08/09/1974; Records of the Watergate Special Prosecution Force, 1971 – 1977 ; Record Group 460; National Archives and Records Administration. During the early hours of June 17, 1972, Frank Wills was the security guard on duty at the Watergate office complex in Washington, DC.. This log shows that at 1:47 a.m. he called the police, who arrested five burglars inside the Democratic National Committee Headquarters. Investigation into the break-in exposed a trail of abuses that led to the highest levels of the Nixon administration and ultimately to the President himself. President Nixon resigned from office under threat of impeachment on August 9, 1974.